NEW YORK - After a smooth relocation of six airlines to different terminals at LaGuardia Airport, Delta's operations at the hub are now consolidated in Terminals C and D. Delta Shuttle flights to Chicago and Washington, D.C., have moved from the Marine Air Terminal to Terminal C.
The Friday-night move, which had been planned for months, was executed to support the airport's ongoing $8 billion redevelopment project and marks a significant step toward the construction of Delta's own state-of-the-art facility there. "Consolidating our operation at LaGuardia moves us closer to Delta's future $3.9 billion, 37-gate facility as the airport moves ahead with its historic redevelopment into a completely rebuilt and unified 21st-century transit hub," said Henry Kuykendall, Delta's S.V.P. – Airport Operations, Northeast. 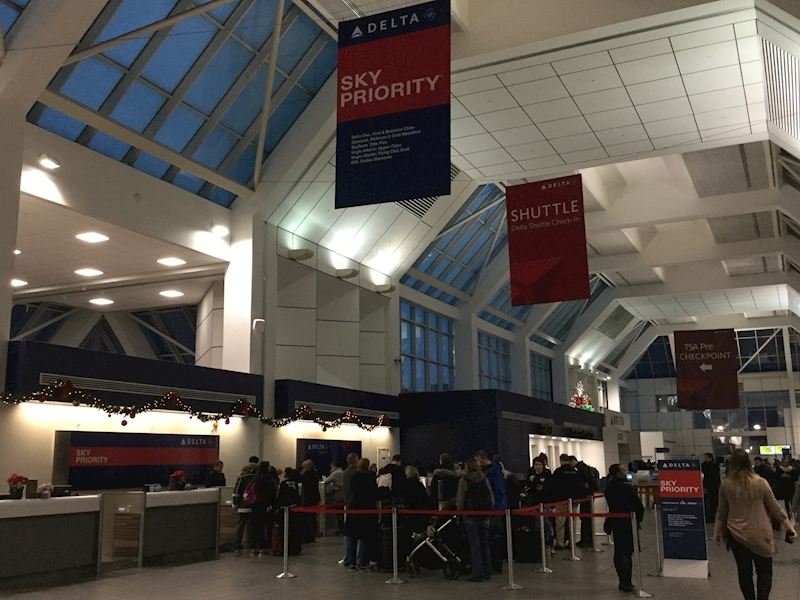 Even as the first snow of the season started to fall at the airport Friday, Delta teams removed widget branding and signs at the Marine Air Terminal while other workers began installing Delta kiosks, counters and equipment in the Terminal C check-in lobby and gate holdrooms vacated by American Airlines. It all had to happen in the eight hours between when the last flights departed Friday evening and the first customers arrived early Saturday. Regional Facilities Manager George Guillaume coordinated much of the cross-divisional effort, which relied not only on Delta people from across the company but involved close coordination with other carriers and the Port Authority of New York & New Jersey. "A tremendous amount of planning, coordination and execution was required to pull this off, and I experienced firsthand what makes Delta people special. We all worked tirelessly to make sure that this change was seamless for our employees and customers," he said. Tyshawn Dunbar, who managed the information-technology needs for the project, oversaw teams responsible for setting up technology at the gates, ticket counters and support space that Delta took over in Terminal C.
"We all hit the ground running because we didn't have a lot of time to get our technology in place," he said. "But we did exactly as we planned and were able to implement everything flawlessly. The most exciting part of this project was working alongside Corporate Real Estate, Airport Customer Service and my fellow colleagues in IT to make it all come together." Members of Delta's Peach Corps volunteer wayfinders will be stationed at the airport all week to assist customers. In Terminal C, Shuttle customers will continue to enjoy the distinct features of the Delta Shuttle product while gaining access to dedicated check-in counters; expedited security with CLEAR, dedicated TSA Precheck lanes, a Shuttle security line, a 7,600-square-foot Delta Sky Club and chef-driven restaurants, an expansive food hall and upscale retail.